I glued two pieces of plastic on either side of the board and tightened this "band-aid" with a screw to reinforce the joint. Note the tab on the right side of the board (see the next picture). The stereo head unit on a 1994-1998 Saab 900 does not have a CD player, which is a bit strange for an entry luxury car of the mid-90s. However, it does support Clarion C-Bus CD changers. Just plug and play. subsequent attempts to press "CD" on the head unit result in a brief message CD1 TRK 01 and then the unit switches back to radio again. 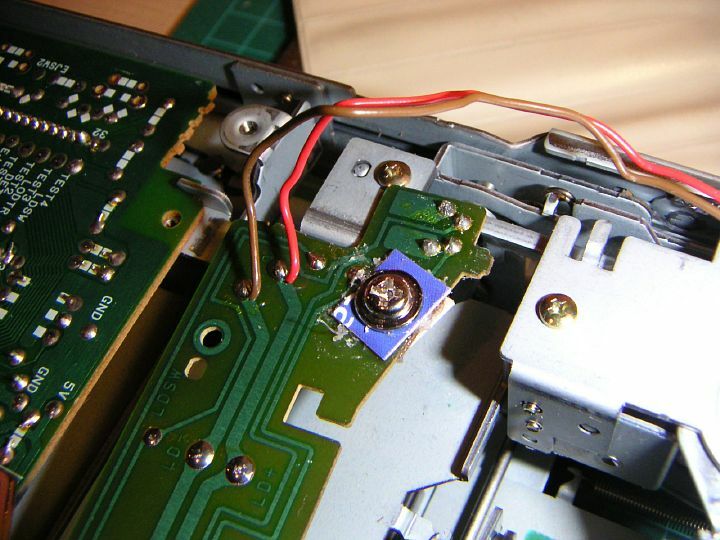 If you take off the cover and watch the changer trying to load a CD, you discover that it would indeed try to pull a CD from the cartridge, load it into the player, and then do it again, and again, and then stop after a few more attempts.